Anti-aging, relaxing and cooling treatment in just 20 minutes. 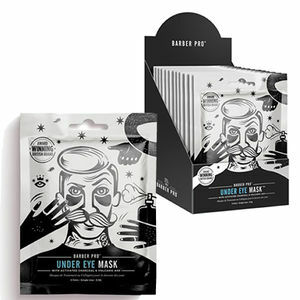 Barber Pro's Under Eye Masks help to combat fine lines, wrinkles and dark circles, while improving skin clarity, tone and elasticity. The hydrogel masks are ready to use straight from the packet and take just 20 minutes to deliver a nourishing treatment, utilising the benefits afforded by their key ingredients: Activated Charcoal, Marine Collagen, Green Tea Extract, Aloe Vera, Vitamin-A, Vitamin-E and Citrus Extracts. In particular, the utilisation of Marine Collagen, combined with these key vitamins, herbs and botanicals relieves the effects of tired, swollen and puffy eyes to offer the area a soothing firmness. They are also free of Mineral Oils, Lanolin and Petroleum and hasn't been tested on animals.